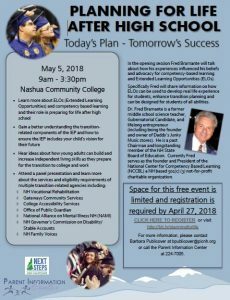 Learn more about Extended Learning Opportunities (ELOs) from Fred Bramante, former teacher, lifelong entrepreneur and past Chair of the NH State Board of Education. Get a better understanding of the transition elements in an IEP. Get ideas about how young adults can increase independent living skills. Attend a panel of representatives from many different agencies.